For very good reason, organisational change can be daunting for both managers and employees. Overcoming resistance to it is one of the major challenges facing change management professionals. Indeed, just the prospect of change can trigger resistance among staff. 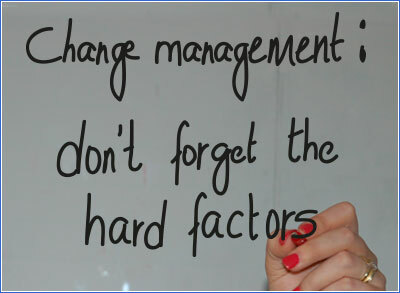 When confronted by fear, change fatigue, survivor’s syndrome, low staff morale, resistance, sabotage and the like, it is unsurprising that a change manager’s attention is often focused on the human factors. Too often though, it seems that the focus on human factors has come at the expense of hard factors, such as planning and control. Change in an organisation is, by definition, a change in the control environment. Corruption is made possible through incentives and opportunities created by change that have unintentionally weakened the control environment. The ICAC’s 2014 public inquiry involving the NSW Office of Water, for example, illustrated how organisational changes can have unintended effects on the control of operations. In this inquiry, the ICAC heard how a regulatory and water licensing agency with offices across several existing smaller regions merged these into two large regions. The result was that some managers were physically separated from their offices and the day-to-day operations for which they were responsible. With one manager around 600 kilometres away from the office they managed, a local team leader was able to work around prescribed processes. As a result, a former member of Parliament was able to corruptly influence the local team leader to provide him with a water allocation that was well in excess of his entitlement. When the Department of Health merged with the South Eastern Sydney Area Health Services and Illawarra Area Health Service in 2007, the accounts payable unit was reorganised and transferred to Health Support Services. Unclear and unworkable policies and procedures, the loss of experienced staff and the lack of training for new temporary staff meant that the accounts payable system was weakened and allowed the payment of false invoices generated elsewhere in the organisation. As a result, during its 2011 public inquiry, the ICAC heard how a PhD student obtained $700,000 as payments for services related to clinical trials that were not provided to the Royal Hospital for Women and the Royal North Shore Hospital. The student used a company that she had an interest in to claim the funds via submitted false invoices. Similarly, weaknesses were created in the control environment with the merger of the Rail Infrastructure Corporation (RIC) and the State Rail Authority to create RailCorp. The ICAC’s public inquiry, which began in 2007, showed how the merger of the two audit teams was not properly integrated. For example, a critical RIC audit report that identified many of the matters uncovered by the Commission went to the wrong board. The ICAC found that accountabilities were unclear and reporting arrangements were sometimes non-existent. As the two organisations were brought together, there were two sets of procurement rules in place – one centralised and one decentralised – giving procurement duties to large numbers of lower-level staff. With thousands of transactions occurring within the rail system, such weaknesses in control created corruption vulnerabilities. As a result of the RailCorp inquiry, the Commission uncovered at least $19 million worth of contracts that were improperly allocated. There were also many instances of bribery, unauthorised secondary employment, failures to declare conflicts of interest and timesheet fraud. Change can create significant control weaknesses within an organisation. As the above investigations illustrate, the consequences of inadvertently damaging the systems and structures in the process of change can open the organisation to corruption. The Commission’s forthcoming report, Keeping it together: the importance of systems and structures in the chaos of change, identifies a number of measures to guide public sector managers to better manage the risks of corruption during or following the change process.